A new poll from a flight comparison site has revealed the UK airlines with the most attractive airline staff, according to British holidaymakers. ‘Virgin Atlantic’ topped the poll, with Irish airline ‘Ryanair’ coming in last place. 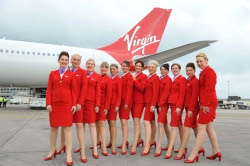 Virgin Atlantic has topped a poll surrounding the UK’s most attractive airline staff, according to a study from a flight comparison website; pipping the likes of Thomas Cook and easyJet to the post. The poll formed part of a study into the airline satisfaction of UK holidaymakers, conducted by flight comparison site www.Jetcost.co.uk. 1,221 UK fliers aged 18 and over subsequently took part in the study, answering questions surrounding their attitudes towards flight attendants. Irish airline ‘Ryanair’ came bottom of the votes for ‘most attractive airline staff’; clinching just 5% of the vote by UK fliers. Following the results from the Airline Satisfaction Awards, Jetcost.co.uk decided to conduct a follow-up poll to delve deeper into the thoughts of UK fliers when it comes to the appearance of airline staff. Those taking part were asked if they felt that it was ‘important’ for airlines to employ attractive members of airline staff. To this, the majority of those taking part, 57%, answered ‘yes’; whilst almost two fifths, 38%, said ‘no.’ Just 5% claimed to have no opinion. Those was answered ‘yes’ were asked to explain why they felt that employing attractive airline staff was important. Almost two thirds, 67%, explained that they believed that attractive staff ‘gave off a better impression of the airline’; whilst a quarter, 23%, simply explained that attractive staff made for a ‘more pleasant flying experience’. However, when asked if they believed that airlines should consider looks as the most important factor when recruiting airline staff; the overwhelming majority of respondents, 88%, answered ‘no’. Thanks. Enjoy reading. See you around. I agree with you Filman. I see Sir Richard in the news very often, his achievements and accomplishments both in business and his charity world. He's really cool!